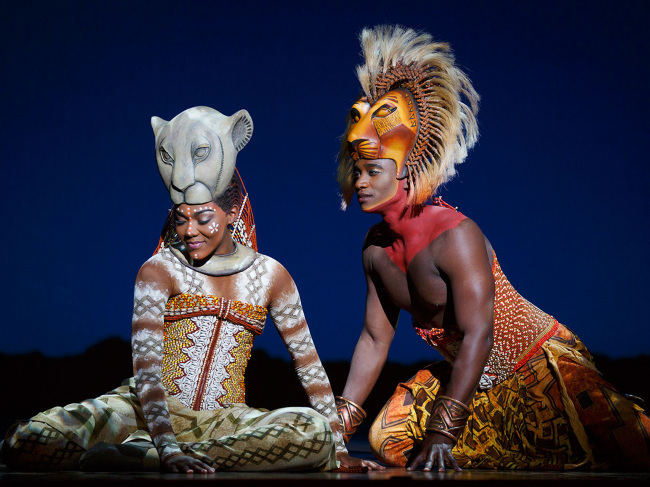 Beloved 1994 Disney animation “The Lion King” has been made into a Broadway musical seen by 95 million people across the world since 1997. More than two decades after its debut, the musical will land in Korea later this year for its first performance in its original language. An international tour of “The Lion King” will land in Korea in November for performances in Daegu, Seoul and Busan. It will kick off at Keimyung Art Center in Daegu -- where it will play from Nov. 9 to Dec. 25, before moving to the Seoul Art Center for performances from Jan. 10 to March 28 next year. “The Lion King” will wrap up its run in Busan at the Dream Theater, the first theater exclusively for musicals in Korea’s second-largest city. Kicking off the event was “Circle of Life,” performed by the Ntsepa Pitjeng in the role of Rafiki the mandrill, a close friend of King Mufasa and a mentor for his son and heir Simba. While a key character in the movie, the role has been expanded to represent the spirit of the continent itself in the show. With the beloved song being performed, a Korean ensemble joined Pitjeng onstage to provide the chant in the African tongue. In the show, they are to dress as the grassland itself to resemble the broad savanna. “The idea was to make it look like savanna was singing. ... In the movie, the music is in the background, but it (the savanna singing) is the front and center (of the show),” Gamba said. 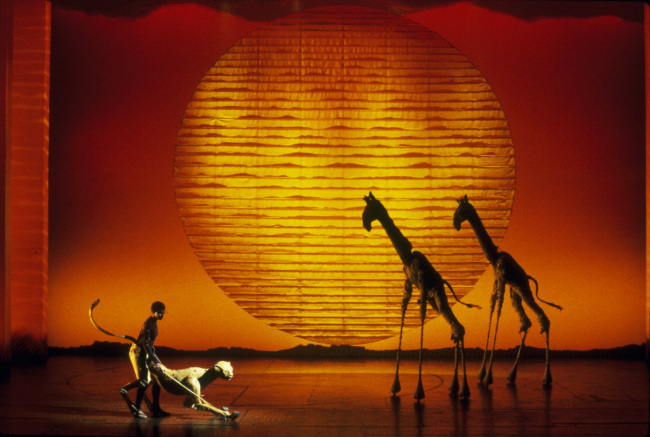 While “Circle of Life” was performed in English, traces of Africa could be felt in African languages adopted for other songs like “Endless Night,” an original song in the musical performed in the scene where Simba is lost and wanders off after a tragedy occurs in the family. Original songs were key to expanding the five songs in the movie composed by Elton John and Tim Rice, and South Africa’s Lebo M. reinforced the element of Africa with his touches. Gamba explained he brought the core sound used throughout the show. What stands out about the show is that unlike other plays starring animals, it does not try to hide the humans playing them. Julie Taymor, the director of the original play, noted the story -- heavily influenced by Shakespeare’s “Hamlet” -- is not about the animals, but humans. By making the mechanism visible, she wanted to highlight the films. In the show, a herd of gazelles is depicted by a person holding model animals and dancing. Masks and attire of the main characters continue this approach, sharing their characteristics. One mask of Mufasa has a balanced, round look reminiscent of the circle of life and harmony it accompanies, whereas one of Scar -- his evil brother who is the main antagonist -- has far less mane, is angular and has a broken look to it. “We wanted to keep the essence of the character, but push it forward in a highly theatrical way,” said Gamba. The masks are also on top of the faces, not covering them, to highlight the emotions the characters go through by showing facial expressions on the actors’ faces. The characters are not really designed to look like animals, but more like members of an African tribe. Simba and Nala’s Academy Award-winning song “Can You Feel the Love Tonight” has both actors moving in what is reminiscent of a traditional African dance. Gama explained that Nala has a more significant role of a “warrior fighting for her nation,” as Taylor wanted to strengthen the female point of view. For Koreans, this would be the first chance to finally enjoy the show performed in its original form and with African actors. A local production of the show was performed from 2006 to 2007 in Korean. It was the only production beside a Japanese version not to have leading African actresses throughout. The show will be 150 minutes long with an intermission and a minimum viewing age of 8. Initial opening for the tickets online will be Aug. 28 at 11 a.m. for Daegu and 2 p.m. for the Seoul performances.